For todays card I limited myself to a simple color palette, starting with black Kraft Core card stock and adding purple & white. My original plan was to have an open windows so you could see through to the inside of the card, but I’m actually still debating if this will end up as just a card front so there is room to write inside... I do love two-toned card stock as a base for a card, especially when you can see both colors from the front! After die cutting one of Tim’s new Wildflower Stems, I selected a Stacked Deckle frame to cut in a size that would give a nice overlap. I then selected a sentiment (this is from an older set by Dina Wakley) to fit the window. 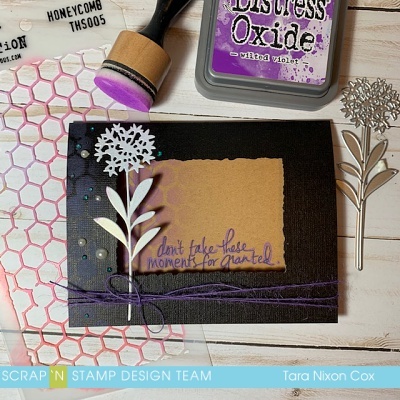 I chose Wilted Violet Distress Oxide to stamp & stencil some color into my background (which is mostly inside the card) and added some coordinating jute for texture. 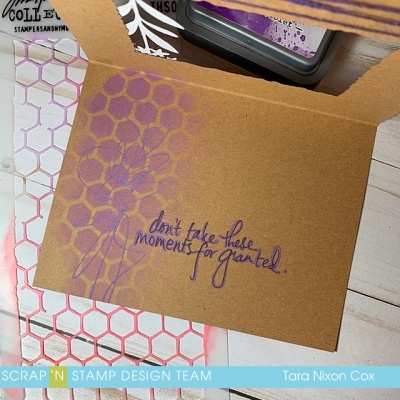 I chose a honeycomb stencil by Tim Holtz for the natural design (it's out of stock, but this similar one by Penny Black is available) and I applied some simple sponging with a mini ink blending tool. 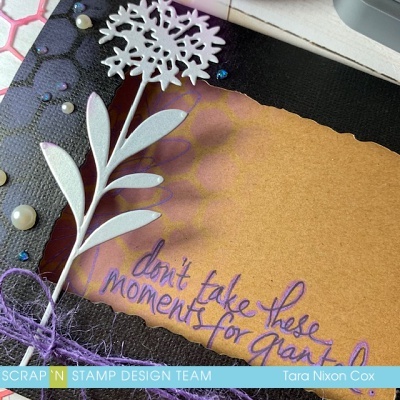 I stamped my sentiment and a scribble from Media Marks in the same ink- it's amazing how sponging and stamping can give these different variations of color with just one ink pad! I decided to use a fine black pen to write over the stamped sentiment and give a sort of shadow effect, just to add a bit more weight to the words and make them stand out. I hope you like it! I've got another card with a similar concept in process which I'll share another time!